Nathalie Kraynina Fall/Winter 2013 collection is all about bringing the South American mountain regions’ customary silhouettes to New York. 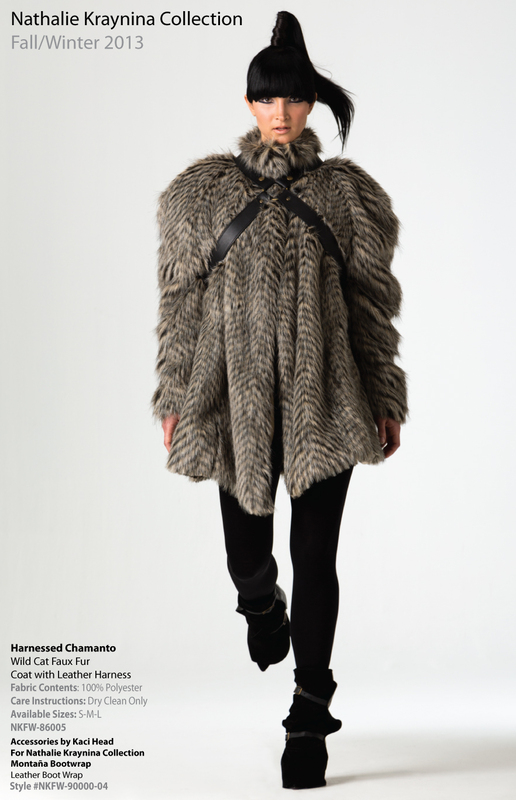 Faux fur, heavy wools and cashmere knits put a modern twist to the classical ponchos from Argentina, “the Chamanto” blanket coat from Chile and the traditional “Pollera” circle skirt from Peru. Inspired by the warm vibrant colors and traditional geometrical motifs of these countries, Nathalie Kraynina’s collection continues to speak to the busy New York woman. For Fall/Winter 2013 Kraynina has brought her a dramatic faux-fur mantle harnessed at the chest, an easy-to-wear gabardine maxi skirt, and a playful sky-blue hooded cape paired with faux-fur leggings ideal for the New York winters. The collection portrays a strong and powerful warrior ready to take on the cold. The looks become complete with the refined collection of Kaci Head, who presents her debut line of luxurious leather accessories. She has created geometric cutout leather cuffs, matching faux fur boots wraps and leather harnesses to compliment each outfit. Head’s leather touch gives the silhouettes edge and sophistication. With the beat of war drums the runway presentation reminded women they are contemporary warriors who carry strength and power fighting not only the cold but modern everyday life.